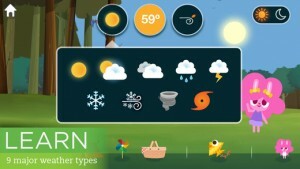 MarcoPolo Weather iPhone App Review. I am always mesmerised by the Educational apps in the App Store. I don’t know if kids are as excited as I am discovering them, but I find them absolutely amazing. They make learning, reading, writing so fun and easy to understand. And Marco Polo Weather makes no exception. Actually, it is one of the best, new, and free apps to download this week. 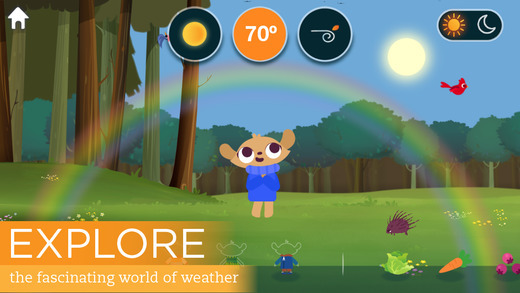 Marco Polo Weather is a great educational app that helps your child learn about yet another new and interesting subject: the weather. With an interactive platform, where he can play, experiment, and explore, he will discover how all climatic phenomenas take place. Not just by hearing about them, but also by seeing how it all happens. It’s extremely fun and captivating! To begin with, your child has three sweet-looking creatures to pick from and see how they react during different weather changes. And how the environment around them also reacts. Tap on the Sun icon and learn where rain comes from, what snow is, and the difference between a blizzard, a tornado, and a hurricane. Modify the temperature from -4 degrees Fahrenheit to 104, and see how the environment, and the creatures react to the change. And also how the change in temperature has different effects when it snows or it rains, on a sunny or a cloudy day, and so on. 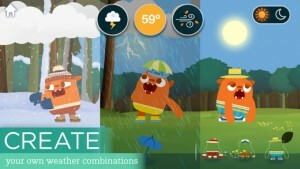 Add some wind, with different intensities, and your child will discover every possible sort of weather forecast, before actually seeing it in real life. Clearly, the nicest part about Marco Polo Weather is that you child can choose from all sorts of weather phenomenas and temperatures, and actually see how all these things work. But what’s even nicer is that he also learns how to respond to all these phenomenas. By looking at the environment, and through the emotions shown by the adorable creature on the screen, he learns how all these changes feel like. Your child can discover, on his own, what clothes are more appropriate for different types of weather. When you can build a snowman, go out for a picnic, or plant a flower. And how all these things react when the weather changes. Marco Polo is an extremely interactive, and beautifully designed app. It is free to download, and totally free of charge to discover part of the phenomenas, and weather changes. However, to enjoy the app at its fullest, with all its options, an in-app purchase of $1.99 is required. But I think it’s more than fair, if you come to think that a children’s book about weather costs way more. And it’s not even half as interactive as this app. All in all, I think Marco Polo is totally worth it. It’s fun, educational, interactive, beautifully designed, and price-worthy. Plus, it’s something new. 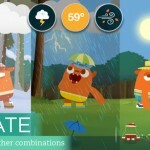 It’s not an interactive book teaching your child about the weather. It’s actually an interactive environment he gets to shape and see how it reacts to all these weather changes. And I, for one, find that absolutely amazing! What do you think of MarcoPolo Weather? Scroll down for our comment section and let us know!